The hotel has been nicely updated inside with a completely renovated bathroom. Walls are a little thin however as I could hear the adjoining rooms tv and going to the toilet. Kept neat and clean though and ok for around $90. Great Stay Friendly staff with good advice, lovely spot and convenient, great little restaurant around the corner as advised by staff. A quick look through #Maroochydore will give you major travel goals — and with so many different hotels available, it won't be long till you can start ticking them off! Stay a short distance from the action if you want to feel this destination's true buzz. 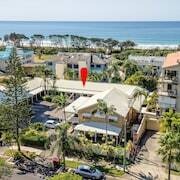 lastminute.com.au offers 105 hotel options within 5 kilometres of Maroochydore's centre. Did someone say 'spoiled for choice'? To live it up in among the action, look into the Horton Apartments and the Top Spot Motel. 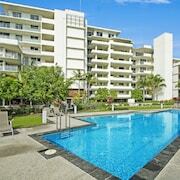 The Space Holiday Apartments and the M1 Resort Maroochydore are also worth looking into. 2 kilometres out of the heart of town is Alex Beach, which has 26 accommodations. 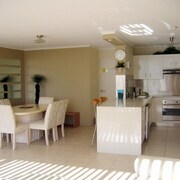 We recommend the Aqua Vista Resort and The Sebel Maroochydore. Try not to use up all your savings at Sunshine Plaza. 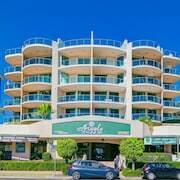 The Oceans Mooloolaba and Alexandra on the Pacific should be well up on your hotel hit list if you'd like to stay close by. Show the locals your style and skill with a round of golf at Twin Waters Golf Club. Fortunately, The Sebel Twin Waters and Sand Dunes Resort are nearby, so you can swing by and see it as often as you'd like! Unfortunately, there are only a small number of cheap accommodations for budget-conscious travellers. 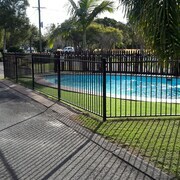 Of these, Maroochy River Cabin Village & Caravan Park is up there with the best. Want more options? 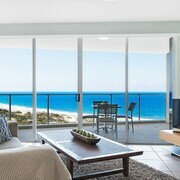 The Fairshore Noosa is located 30 kilometres away from Maroochydore, and the Spicers Tamarind Retreat is 25 kilometres away. 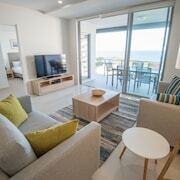 If those ones don't float your boat, you might prefer the Netanya Noosa or the Eumarella Shores Noosa Lake Retreat. Designer jeans or year-round shorts? However you roll, you're certain to enjoy a trip to Woombye, 10 kilometres away. With Foote Sanctuary of Buderim and Sunshine Coast Flyboard X-perience to explore, you won't be bored here. 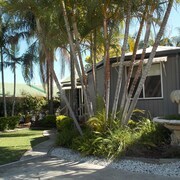 The Sunshine Coast Motor Lodge and Nambour Lodge Motel are some of the apartment and hotel options here. Alternatively, you could stay in Rosemount, 11 kilometres to the west of Maroochydore, where you'll find the Amytis Gardens Retreat Spa and Cooking School and Red Bridge Motor Inn. Whether you're just passing through or staying in Rosemount, make sure you visit Sunshine Castle and Big Pineapple. Completely over trying to nod off upright? Hanging out for a soft pillow? Then pick up a room at the Novotel Brisbane Airport. 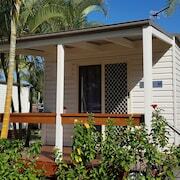 It's seriously close to Brisbane Airport, which is 80 kilometres from Maroochydore's centre.